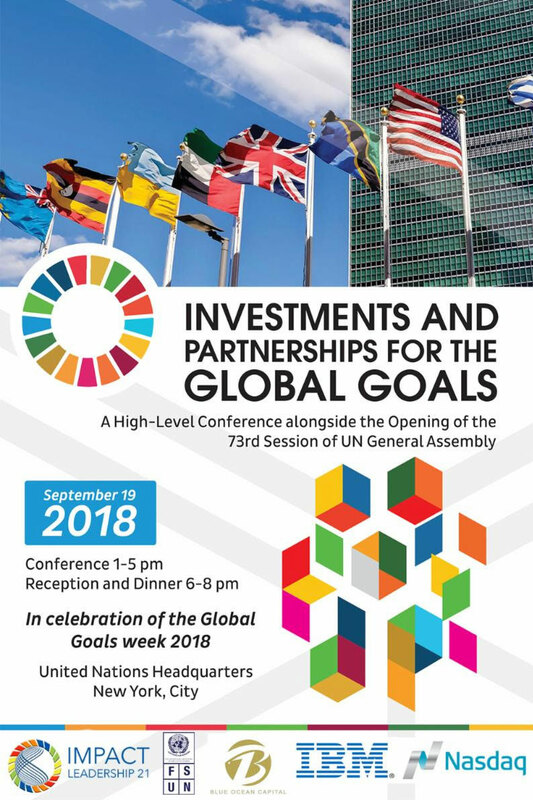 The Foundation for the Support of the United Nations (FSUN) and Blue Ocean Capital co-hosts the “Investments and Partnerships for the Global Goals” Summit, alongside the opening of the 73rd Session of the UN General Assembly, and in celebration of the Global Goals Week 2018. World leaders and heads of states, celebrities, political leaders, business leaders, the diplomatic community and civil society members will gather to support the overall mission of accelerating the Sustainable Development Goals (SDGs) . Permanent Representative, Permanent Mission of Czech Republic to the United Nations. Former President at UN ECOSOC. Co-Founder & Curator, SDG Marketplace and Triple Revolution Collective and Co-Founding Partner, the 5th Element Group and Decade of Women. The Foundation for the Support of the United Nations (FSUN) is an NGO in General Consultative Status with the United Nations Economic and Social Council (ECOSOC) since 1996. As the liaison office to the United Nations, FSUN-UNO serves as the Foundation’s focal group at the United Nations. Headquartered in New York. FSUN-UNO works with the United Nations Secretariat, programes, funds and agencies in various ways, including in consultation with Member States, information dissemination, awareness raising, development education, policy advocacy, joint operational projects, participation in intergovernmental processes and in the contribution of services and technical expertise. FSUN and Blue Ocean Capital will hold a grand theme summit and award ceremony in United Nations Headquarters on September 19, 2018. The summit include: Global Investment Forum, United Nations luncheon, Blockchain forum, Awards Ceremony, Networking reception, VIP-Presidents’ reception, and United Nations dinner party.